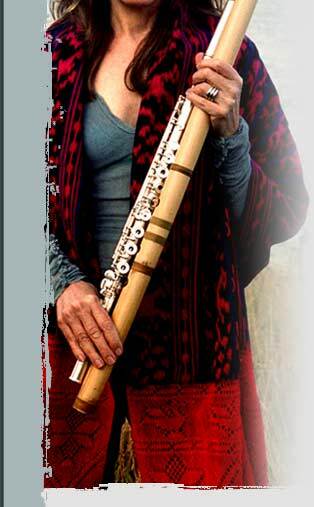 Silver and bamboo flautist Sally Block plays evening Indian raga melodies and modal improvisation, featuring a classic form of call-and-response called jugalbandi in India, also used in jazz, with instrumentalists on Indian slide guitar, violin and the one hundred stringed Kashmiri santoor. Jazzy muted reed cornet and harmonica punctuate eastern, Moroccan and rock rhythms. Rhythm & Raga. World Music. Halfway to Midnight, when evening merges into night and relaxation into passion. This journey begins on a Banyan tree lined road in India. The last streaks of color from sunset are disappearing and evening is turning to night. Cool air brushes your face as you hear crickets begin the beat. It’s halfway to midnight. This music is appropriate for calming your hyper active dog, soothing your aching mind and heart, yoga, intimacy, dancing through bustling city streets or ambling down a lonely road. Special Thank You to: G.S. Sachdev, the Goddess of Music Saraswati, The Family Block, Will Ryan, Chris Pfund, Tim Healy, Bob Borbonus & Taylor Guitars, Mini Cooper for teleportation & to all named musicians and technicians for such heart, soul & expertise.